In tomorrow's 2.9 release (b331+) we have added in an ESRI Feature Layers data feed. This is available in the 'Feeds' section of DataManager. This feed allows you to connect an ArcGIS Server (or ArcGIS Online) and browse/select Feature Layers. After selecting one or more layers you can download this data as an Omniscope dataset. You can then visualise this data in a Map View. Searches can be filtered on keywords or access levels and the results can be sorted on various fields. 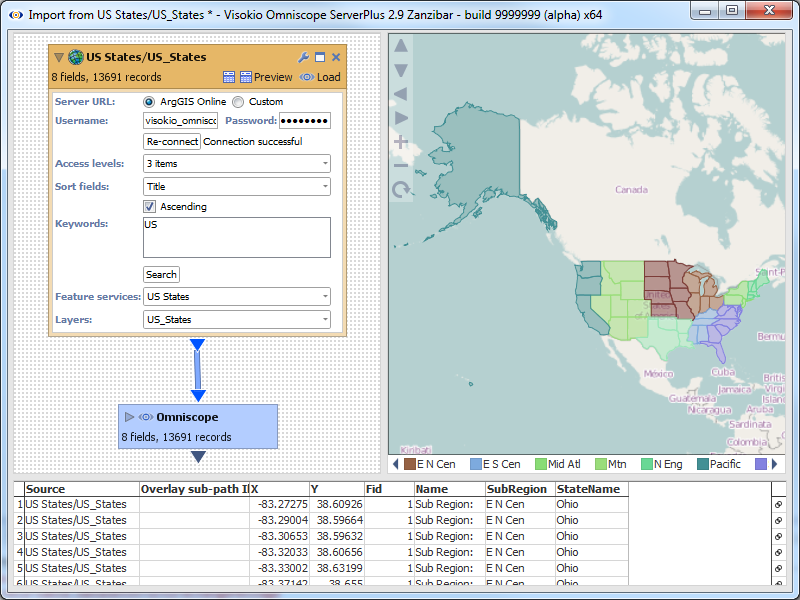 In the screenshot below we have connected to ArcGIS Online and loaded United State boundaries which are shown on the Map View. If you already have an ArcGIS Online account then you can use this functionality straight away. If you don't have an account then you can sign up at https://www.arcgis.com/home/signin.html. Please let us know if you have any questions regarding this functionality or if you would like a demonstration.